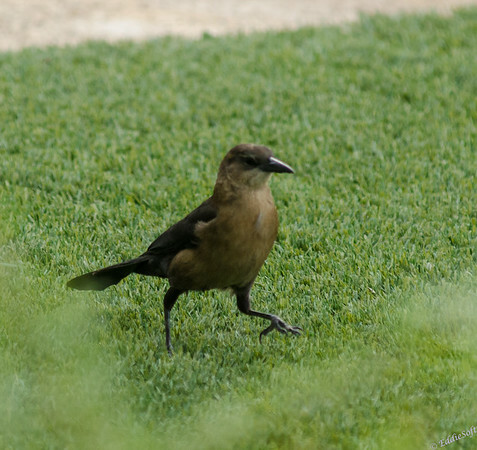 Another key difference, in my opinion, is Cowbirds don’t look as menacing as this bird. Clearly there was a cause to break out the reference books and do some digging. 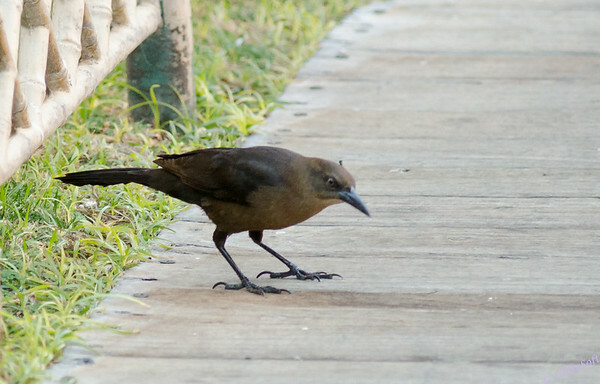 It took some time since simply using a “brown black bird” doesn’t get you very far in Google.. scratch that .. it gets you a WHOLE BUNCH of links on .. you got it Brown-Headed Cowbirds. 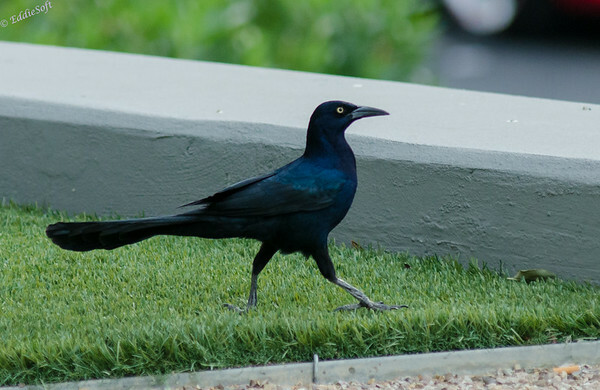 It did confirm that this Vegas bird was not one of those. I then tried an identification site calling out primary features like the dagger beak, unusually large feet/talons and a fairly long tail. Again, no exact matches or really any close enough to get me to an educated guess. This left one route again based on a Golden Rule of mine. Whenever possible I try to snap a few shots of any other birds that might be in the vicinity for the specific purpose of aiding identification. I use this more in the water fowl category since the females all tend to look similar (brown on brown). Sometimes there will be a male hanging out nearby and those are much easier to identify. 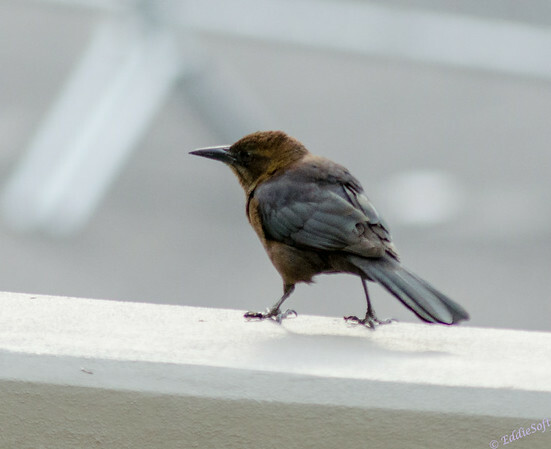 Unfortunately, there were no other shots of birds in the tin for that sighting, but did locate another shot of similar looking bird in another part of Vegas. We were actually hanging out on the side of the road watching the end of the year NASCAR celebration when this specimen walked right up to me – if only my gambling that week had been as lucky! The important thing about this particular shot is …. wait for it … this shot was take a few frames later. Now I do happen to know what that is and in fact it has been featured previously on the Blog (link here). It was also noted that shoot was also taken near Vegas so now we are talking! A quick look at the reference books helped to confirmed a suspicion I had – that being the featured bird is a female. 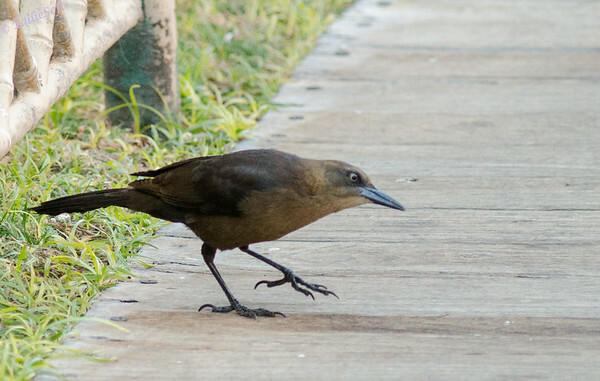 Same beak, same stature and sure enough the brown is carried through the head to the body with black wings and tail. Note, the yellow eye pretty much put the bow on it, but the shot above the male threw me off the scent – guessing it was just a lighting issue or I accidentally screwed up in the darkroom. 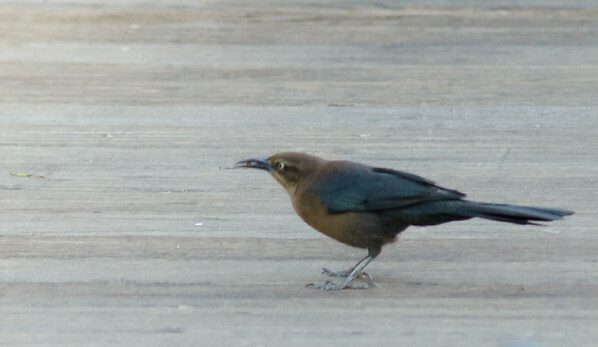 After all that my final position is a female Long-Tailed Grackle. Please let me know any opinions you might have that differ from that assessment. Lastly, I’ll leave you with this shot. Again, sorry for the softies in the last two posts, but wanted to get them on the blog so I could check them off my list (although this one is only a half check since I had the male already). I agree that it’s a female-male match! 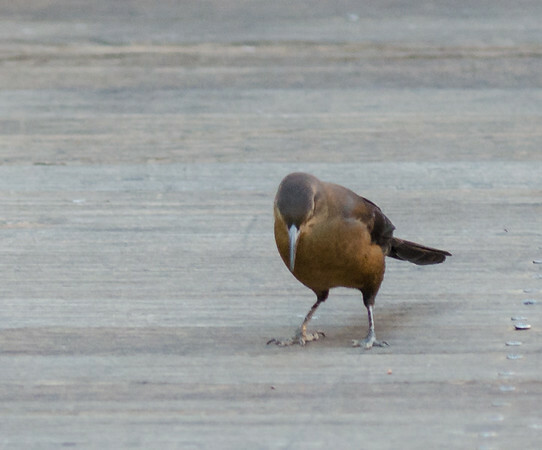 And that’s a good tip to take neighboring birds to help in identification. If nothing else, individual birds can have significant color variations to the standard colors. This reminds me that I took a whole lot of shots of flowers on tropical plants in the Cairns Botanical Gardens one afternoon, and it never occurred to me until the very end to also take photos of the names of them on the plaques at the foot of the plants. Doh! Hellacious talons on those birds. Another reason for assuming that it’s a juvenile in the last photo. I assume you deployed that tactic while in Australia!! You need a UB. I go around taking pictures of the caged birds in zoos and make Linda come behind me and take pictures of the name plaques – …before you respond. it is because she is the UB and that is what UBs do. Remember – one is a mistake a hundred is a style! The Cairns Botanical Gardens are in Cairns, Australia, so no, I didn’t use that tactic in Australia after all. I did, though, take the opportunity when presented to take photos of bird descriptions in nature centers and on outdoor boards that I thought would be useful in identifying birds. In fact, I took a picture of a poster of Australian birds in a store for reference. I just never thought of it for the flowering plants. By the way, spooky story. So I’m walking around the Botanical Gardens taking pictures, and I freeze because I suddenly realize there’s a young woman standing motionless in the walkway along my left looking my way, and somehow I knew she had been standing there motionless for quite a while. I might add that I had just taken pictures of a really spooky old, abandoned fernery (a building containing ferns…) that was cordoned off. So I look over there and she continues to stand there with hands clasped without making any movement. She was dressed in some kind of multi-colored hippie thing. Then she takes two steps forward and stops again motionless with her hands clasped as before. She keeps doing this, coming my way, and all I can think of is the hedge maze in The Shining. So I split, and later I saw her moving through the gardens just like that. And much later I came around a far corner of the gardens, and she’s sitting absolutely still on a bench looking at me. Freaky. So I fled the country.